Classic "tapping" form of a glass tube "filings coherer". A coherer is a type of radio detector, popular in the earliest days of radio development, beginning around 1890. Coherer receivers, used in conjunction with spark-gap transmitters, were the first devices to make radio communication practical. However, although hailed at the time as a "marvelous electric eye", their relative insensitivity and unreliability led to their replacement by more sophisticated detectors, so the device that helped create a communications revolution disappeared from commercial use by around 1905. The defining characteristic of a coherer detector is a "light-contact" segment that is normally a poor electrical conductor, but which undergoes a sudden change in conductivity — usually a marked increase — in response to increased voltage, including that induced by a received radio signal. A limitation of coherers is that they cannot be used for full audio reception of radio signals, and are limited to receiving simple on-off transmissions, such as the telegraphic dots-and-dashes of Morse code produced by the intermittent keying of a transmitter. The basic phenomenon on which the coherer is based was discovered independently by a number of investigators prior to the development of radio. In the mid-1800s, various experimenters noticed that lightly touching objects, as well as loosely compacted particles, often clung together in reaction to nearby sparks and strong electrical currents, although they instantly separated and returned to their original state when physically jarred. It was also found that the light-contact configuration normally had a high electrical resistance, but after coherence occurred the resistance decreased dramatically, and the connection became highly conductive. In 1852, in a development that anticipated the relay circuit (see below), S. A. Varley used this effect to invent a lightning arrester to protect telegraph wires. His design consisted of a wire running from the telegraph line to the ground, in series with a segment containing loosely packed carbon granules in a wooden box. Under normal conditions, no electrical current could flow though the carbon granules because of their high resistance. But the increased electrical current produced by a lightning strike caused the granules to cohere and form a highly conductive electrical path, providing a route for lighting bolt to flow into the ground, protecting the telegraph line, and its operators, from injury. In 1879, David Edward Hughes heard crackling sounds in a carbon-contact telephone receiver whenever sparks were generated by nearby electrical equipment, an effect that was found to span distances up to about 450 meters (500 yards). In retrospect it is apparent that the electrical sparks were generating radio signals, and the telephone receiver was acting as a form of microphonic circuit (see below), however, at the time radio waves were not yet known to exist, and Hughes did not publicize his findings, so the discovery was lost until it was re-encountered by radio experimenters. The physical reasons behind the coherer phenomenon were never fully explained, in part because the devices were supplanted by other detectors before their workings were fully understood. Contemporary research suggested the coherer effect might be the result of electrostatic forces, of a mechanical piercing of surface oxidation between adjoining light-contact elements, or a localized thermal effect at the contact points. Moreover, because of the multiple configurations and materials employed, individual results were likely the result of more than one cause. In the 1880s, Heinrich Hertz became the first person to demonstrate the existence of radio waves, at the time commonly known as "Hertzian waves" or just "wireless". However, the receiver used in his experiments was a simple wire loop, which included a small gap where a spark was visible when a radio signal was received. This loop receiver proved impractical outside of laboratory experiments, as the sparks were so faint that they were difficult to see unless the room was darkened, and the device was so insensitive it could used for transmission distances of only a few meters. Thus, there was a need for a more practical receiver, which led to the development of the coherer as the primary radio detector during the early days of radio research. The first person to demonstrate radio wave detection using a coherer was Edouard Branley of France, who studied the properties of a wide variety of light-contact connections. In 1890 he developed a coherer consisting of metallic filings placed between electrodes in an enclosed glass tube, which he called a radio-conductor. Other experimenters followed, including Russian Alexander Popov, who used his version of the device to detect the radio signals produced by lightning discharges in 1894, the same year that Oliver Lodge of the United Kingdom became the first to apply the term "coherer" to the detector. In 1895, Italian Guglielmo Marconi developed the first practical system of radiotelegraphy, which included an improved version of the Branley filings coherer that was more compact and reliable than previous designs. Many coherers, after switching to the conductive state, remained that way until they were physically jarred, which caused the joined elements to "decohere" and become non-conductive. A variety of techniques, including tapping, shaking and axial rotation, were used to trigger the decohering. 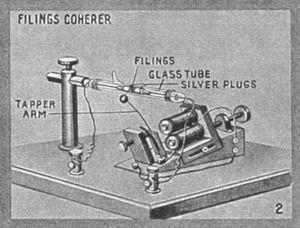 The most common coherer receiver design was known as the "tapping filings coherer", where the coherer consisted of a glass tube filled with minute metal filings, and decoherence was effected by lightly tapping the tube with a tapper similar to a bell clapper. A variety of substances was used for the filings, most commonly mixtures of lightly oxidized metallic particles, especially nickel and silver. Although the filings coherer was the best known version, there was also significant investigation and development of other materials and coherer designs. A variety of alternatives used electrically conducting materials in various light-contact configurations, including stacking steel balls, using a steel needle with each end resting on a carbon block, a metal tripod sitting lightly on a flat metal plate, and a rotating wheel, slightly immersed in liquid mercury that contained a floating, insulating wax film. In some of the later designs, the coherer was self-restoring — instead of having to be physically jarred to be decohered, as soon as the intermittent signal from the transmitter ceased, the coherer automatically returned to its normal state. Circuit diagram of a simple filings coherer (Co) and tapper (T), used as a relay to operate a Morse code telegraph sounder (S). There were two main types of coherer circuits used in early radio development. In the most common arrangement, the coherer triggered a relay circuit. In this case, an electrical current, provided by a battery, was initially blocked by the high resistance of the light-contact segment, until coherence occurred, produced by the increased voltage due to the reception of a radio signal, which allowed the battery current to now flow through the light-contact segment and operate an indicating device, such as a bell or telegraph sounder or register. Decoherence returned the coherer to its high resistance state, again blocking the battery current, thus shutting off the indicating device. One advantage of relay coherers was they could be adapted to record Morse code messages on paper tape, providing a permanent record. In addition, the receiver could be left unattended, to be triggered by a radio transmission, with the incoming message recorded telegraphically for later reading. However, it was soon discovered that relay coherers had many drawbacks for practical commercial use. Even under the best conditions they could not operate at speeds faster than about 15-words-per-minute, perhaps one-third the speed of standard landline telegraph practice. Sensitivity was quite variable and often unreliable — sometimes overly sensitive, and at other times unresponsive, in part because each decoherence left the coherer in a slightly different adjustment. Also, because relay coherers merely recorded that they were receiving a signal, it was difficult to differentiate between the transmissions that were of interest from the interfering ones coming from other radio transmitters, or mere static. In addition to recording messages, one common early use of relay coherer circuits was in wireless remote control demonstrations. A simple, and dramatic, example was to connect the relay coherer to an electronic trigger for a explosive device, to blow up a distant target, often a model ship standing in for a enemy cruiser. Coherers also appeared in experimental remote-control ships, beginning in 1897 on a vessel demonstrated on the Thames River in England by Ernest Wilson and Charles John Evans, and the following year by Nikola Tesla in Chicago. (Tesla developed an hour-glass type of filings coherer, which achieved decoherence by rotating end-over-end). But the lack of practical success led to a fallow period. Eventually John Hayes Hammond, Jr. gained U.S. government sponsorship to develop remote control vessels and torpedos, however, in 1914 he noted that relay coherers had not been reliable enough to meet his needs, so he had moved on to newly developed vacuum-tube circuits. A second coherer circuit arrangement, often referred to as "microphonic", connected a telephone receiver to the coherer circuit, in order to provide audio reception. In this case, changes in the electrical current, due to the variations in coherer conductivity, resulted in changes in the sounds being heard in the telephone receiver, so a radio transmission, broken up into intermittent short-and-long pulses could be received audibly as Morse code. (In these cases, one of the auto-restoring forms of the coherer was normally used). Although the microphonic coherers were not capable of full-audio reception, in some cases it was possible to differentiate between the transmission characteristics of various stations. The first commercial radiotelegraph use of a microphonic coherer appears to have been a link between the California coast and the island of Santa Catalina, set up in 1902 by the American Wireless Telephone and Telegraph Company, which used a light contact between steel and an oxide of iron. Other versions were employed by a number of early developers in the United States, including Walter Massie, Thomas Clark and Joseph Murgas. Although microphonic coherers lacked the relay coherer's capability of providing a permanent record, they could receive telegraphed signals much faster, and working speeds approached landline standards. But even this version of the coherer was not very sensitive, and prone to getting out of adjustment when used in unstable environments such as on shipboard. A series of incremental improvements were not enough to make coherers reliable or sensitive enough to compete with more sophisticated radio signal detectors developed in the first decade of the 1900s, including electrolyic, crystal, magnetic and vacuum-tube designs, which proved to be more practical, and could also be used to receive full audio transmissions. This page was last modified 03:13, 26 March 2008.